Posted in: News. Tagged: Girl in Fish Bowl, Headless Lady, moving mummy, Sideshow. A headless lady, a moving mummy and a girl in a goldfish bowl are among the spectacles brought to life as part of a new exhibition charting Britain’s seaside sideshows. The illusions, once a common feature of piers and promenades, have been recreated for the first time since falling out of fashion in the 1960s. The eccentric performances will be shown alongside never-before-seen colour photographs of post-war British fairground entertainment and a waxwork model of ‘professional freak’ Horace Ridler whose extensive tattoos earned him a living as The Zebra Man. The disquieting creations are part of Showzam, a 10-day festival of variety performances taking place in Blackpool next month. The festival’s main attraction is the Circus of Wonders exhibition of sideshows and images curated by Professor Vanessa Toulmin, the niece of a professional contortionist who is now research director of the National Fairground Archive at Sheffield University. “They were the popular entertainment of their age,” she explained. “Before everyone could afford cars or foreign holidays they were at the seaside and wanted to be entertained. This is part of our history. She said the colour photographs, taken by fairground enthusiast Lionel Bathe, demonstrated the popularity of steam shows and events such as the Festival of Britain. “These pictures have never been on public display and their rare colour makes them very special,” she said. Five “magic” sideshows dating from as early as 1937 will be used in public for the first time since being restored by enthusiasts. 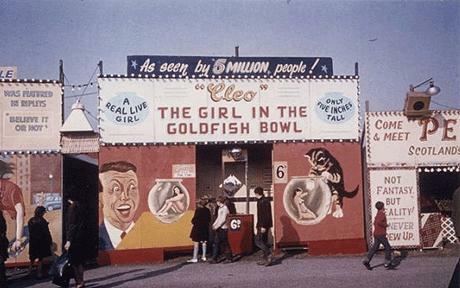 They include Cleo: The Girl in the Goldfish Bowl, Gloria: The Living Half-Lady and The Mummy in which a woman appears to turn into a walking corpse. They have been recreated by touring theatre company Sideshow Illusions with original equipment used by 1930s and 1940s Blackpool fire-eater showman Jon Gresham.